Working in confined spaces may initially seem like quite an uncommon area of health and safety provision. You’d be forgiven for thinking it applies to only a small number of highly specialised working environments, but it is actually quite surprising just how many industries incorporate confined spaces in their operations. From grain handling to welding and cutting; to those working in lift shafts or air vents, in sewers and in subways; in mining, shipbuilding, facilities management; and in any activity involving toxic or asphyxiating atmosphere, you’ll find confined spaces. Where you find a confined space, you’ll also encounter the real and prevalent danger associated with working in one. Injuries and fatalities involving confined spaces are unfortunately all too frequent and often involve successive fatalities or multiple casualties - it’s not just the worker or workers who are potentially at risk, but anyone who attempts to rescue them if and when something goes wrong. According to the Health and Safety Executive (HSE), the failure to appreciate and correctly manage the ‘reasonable, foreseeable risks’ that go hand in hand with confined spaces in the workplace is responsible for the death, on average in the UK, of 15 people working or attempting rescue in this unique and specialised working environment every year - scary statistics by anyone’s book. There will, of course, also be many more injuries and health concerns that people suffer as a result of accidents in confined spaces. Consider the example of the two workers seriously burned when flammable solvent fumes were ignited by an electric sander as they were removing paint from inside a confined space on a small yacht. An investigation carried out by the HSE showed that their employers had failed in their obligations to ensure the safety of these workers, not to mention the pain and suffering they caused them. They were subsequently prosecuted and fined. The tragic deaths of a promising young Irish international rugby player, his father and brother just recently serve as another unfortunate reminder of the real dangers associated with confined spaces - three family members lost their lives after entering an underground slurry tank one after the other in an attempted rescue effort, and were all exposed to and overcome by slurry gases. The risks of working in, or rescuing someone from a confined space cannot be underestimated and it is essential that these risks are properly identified, managed and controlled. Are employers really aware of what constitutes a confined space in the first place? Of the dangers associated with working in such an environment? 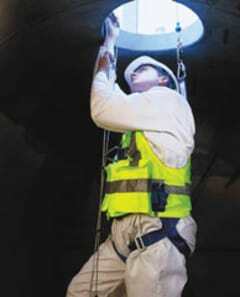 Of how to ensure the safety of their workforce when confined space working really is the only option? Being prepared for the challenges of this unique working environment is essential in ensuring the safety of your workforce - and that’s something that I think can only come from the power of knowledge. It may sound simple but the first challenge to working safely in a confined space is being able to recognise that you are actually operating within one and that’s not always all that straightforward. The Confined Space Regulations 1997 define a confined space as “any place, including any chamber, tank, silo, pit, pipe, sewer, flue, well or other similar space in which, by virtue of its enclosed nature there arises a reasonably specified risk.” One of the most common misconceptions about a confined space is that it will be easily identifiable as a small, cramped space - confined, if you like - but, that’s not always the case. Of course, confined spaces are often small and cramped, enclosed areas that are as a result difficult to enter, exit or work within, but conversely and perhaps somewhat ironically, they can also be very large areas with limited or restricted access. No matter what the size of the working area, a real confined space environment will be one that is large enough for a person to enter to perform tasks, but which isn’t designed for continued occupancy - and it will probably be substantially enclosed, with limited access and other hazards that make it dangerous. A confined space might be a huge container, a small cave or a narrow chimney, either above the ground or below it; it might be a tank, an air vent or an entire subway - or even just a poorly ventilated room. Some places may only be a confined space for periods during their construction, fabrication or when work is being carried out on them. It’s this range and variety that means they’re not always obvious or easy to identify. So just what is it about confined spaces that makes them so potentially dangerous? Well, whether large, small, easily identifiable or not, confined spaces pose a risk to the safety of the people working within them - as well as entry/exit into the area, there is likely to also be some other specific element of risk to the health of the person working within it. It could even be that it’s the nature of the work being carried out that introduces particular or increased risks rather than just the confined space itself. Among other things, there may be poor ventilation so workers may be faced with suffocation from a lack of oxygen, or toxic gases; there may be hazardous substances with their own inherent risks, or danger of submersion from free flowing liquids and solids, as well as other peculiar working conditions either inside the space or nearby. There may be risk of fire or explosion, of entrapment or simply of a fall. A confined space may be an area full of water or bone dry and full of dust, or hard to get in and out of. It might just be a tunnel with poor ventilation and restricted visibility - or, as in the case of the Irish farmers, a slurry tank filled with toxic gases. In the same way that the definition of a confined space is quite broad and all encompassing, what makes that confined space dangerous is not generic either, and will vary from working space to working space. There is no ‘one size fits all’ approach to first identifying a confined space and then to ascertaining what makes it dangerous. This is what makes it such a specialised working environment. Despite these risks, people will still need to get work done in confined spaces, so it’s important to ensure that they do so safely. Under domestic UK law, employers are legally responsible for ensuring the safety of their employees in the workplace, which of course includes any confined spaces. Beyond that, in addition, there’s a moral duty to the health and wellbeing of your workforce too. The first consideration when managing the risk of confined space working is whether access to the area is absolutely essential, or whether there is another way of getting the job done. Confined spaces are dangerous places to be, so it is always worth considering work could be carried out from the outside with long handled tools or remote cameras; clearing blockages with air purgers or seeing inside through viewing windows or portholes perhaps; or even considering whether the work space can be modified in any way so that it’s no longer classified as ‘confined’. Safety considerations should go back beyond this. Indeed, there is a duty on designers, manufacturers and contractors to design, build and modify spaces, ideally without any confined spaces at all but, where that is unavoidable, to do so in such a way as to eliminate or minimise the need to access them during the normal course of events; to ensure easy entry and exit when it is required and to minimise the risks posed once inside them. If there’s no alternative but to immerse yourself within a confined space, then it’s essential to manage the danger element and minimise the risk. After all, the job still needs to get done. For those who will be working within the confined space - and those supporting and supervising them - it comes down to rigorously employing a safe system of work. Ensuring that you have considered the environmental landscape, that it’s been assessed and prepared for the task in hand and that your team have the correct equipment, training and contingency plans really could be the difference not only between getting the job done properly or not, but, more fatally, between life and death. As a starting point, restrict entry to the fewest number of operatives necessary - confined space working is not a party. The principle control should be one forbidding access unless formal authorisation has been granted, using a permit to work system to ensure this. Appoint a supervisor and always make sure that those working within the confined space - and those supporting them - are fully briefed on what they’ll be facing. Make sure your operatives are ready for the task in hand - not just in terms of assessing their physical fitness and competence, but by providing the appropriate work and safety equipment, protective clothing, supervision and contingency/rescue plans. Once you’ve assessed the environmental landscape to determine the level of risk involved, make the area as safe as possible by disconnecting energy sources, flushing away any obvious residues and closing off flues. Making sure the area is isolated from any gas sources and from the potential ingress of any liquids or free flowing solids will help to reduce the chance of any changes to the working environment and of any new risk to the workforce. Even if the area has been thoroughly cleaned, make sure you know what was in there - fires and explosions have been known to be caused by the ignition of substances that were considered long removed but that still, in fact, left residue. Perhaps one the most common and immediate hazards seen in confined spaces are atmospheric - those that affect air quality and present obvious and instantly incapacitating risks to health and life. Make sure the area has been tested for hazardous gases, fumes or vapour and that there is sufficient oxygen concentration and ventilation - or that the appropriate breathing apparatus has been provided. These things must also be monitored continuously while the space is occupied, as atmospheric changes do happen and can even be caused by the work activity. Among other things, specialised equipment may be needed to ensure safe access to and exit from the area, as well as even more specialised equipment for working safely once in situ - low voltage lighting, breathing apparatus or low-spark tooling, perhaps. Remember, it’s not just about having the equipment - it must also always be properly maintained and checked to ensure it is in a good state of repair and full working order. Whether it’s for securing workers or rescuers during their entry or exit into the area, or to help them work safely within the confined space, it needs to be up to the job - and that’s where hiring what you need can help as it will always be fully tested and ready to use. Of course, having clear and pre-planned emergency procedures in place is essential. As is so often the case with confined spaces, the specifics of these will be relative to the task in hand and the working environment, but make sure you have effective arrangements, equipment and training for both raising the alarm and then carrying out any rescue operation, and that everybody knows what these are. There’s a lot to consider, but the best way to equip your workforce to firstly identify the confined space itself and to then manage the associated risks in order to work within it safely is simple: it’s training, training and more training, with a big element of practical experience. Here, the HASAWA (Health and Safety at Work Act) means employers have a statutory obligation to provide the necessary information, instruction, training and supervision to ensure the health and safety of their employees in the work environment. Beyond that, the specialised nature of working within a confined space calls for specific task-related training as well. Being able to identify the risks of a particular working environment, selecting the most appropriate equipment for the job and knowing how to deal with an emergency is something that needs to be taught before you get anywhere near a confined space, and all companies whose employees are required to work within restricted environments should be asking themselves whether they have made sure their teams have had the training they need to ensure they can manage and reduce confined space associated risks. A good confined space awareness course should help employees understand the Confined Space Regulations and how they apply to what they’re doing; it should help them more readily identify a working environment as confined and provide them with the knowledge and skills to access them and operate within them safely. It will also help them to understand the risks posed to both themselves and their colleagues, and how best to manage and respond to them, and it will help to structure a safe system of work that includes assessment of the area and surrounding environment, having - and knowing how to use - the correct equipment, as well as ensuring training and contingency plans are in place. A class-based course will help to give delegates a good overview of the knowledge and skills they need to do this but really, to fully prepare for working in a confined space, they need to learn by getting inside one and applying the knowledge and skills they have gained, practise how they would operate within the confined space, and consider how they would respond to the various risks that may occur. Nothing beats a training course like a bit of practical application. Some training facilities give confined space workers the chance to put theory into practise in a controlled environment. We’ve designed and built a state of the art, custom-made confined space tank to add an invaluable practical element to its confined space training. From the manhole sized entry point, delegates firstly experience how to access confined spaces safely. Once inside, various scenarios can be simulated within the tank, providing a range of hazardous environments for them to respond to - gushing floods, rising water levels, gas leaks, reduced visibility and the like. By offering delegates the chance to get out of the classroom and get to grips with as close to real life confined spaces as it’s possible to simulate, in controlled surroundings, it can help make sure they are fully prepared for working within such environments. As we have seen, confined space working presents a number of potential risks. It is a highly specialised working environment that - let’s be honest - is never going to be without risk. It’s never going to go away, either. We can’t and mustn’t condemn an entire working practise, but we can and must ensure that we handle this specialised working environment carefully, correctly and with due competence. By taking steps to ensure that employees possess relevant and sufficient expertise which includes the right combination of theoretical and practical based training to educate them on correct and safe practise, the risk to those working in or supporting others in restricted environments can be both managed and reduced, as well as helping to ensure a competent, safe and efficient workforce. Confined spaces are not something to be scared of but they are - most assuredly - something to be unreservedly respected.